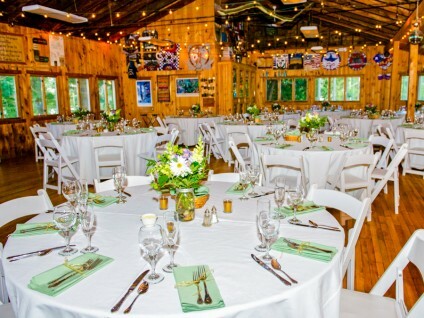 Camp Caribou offers a special and unique wedding venue. 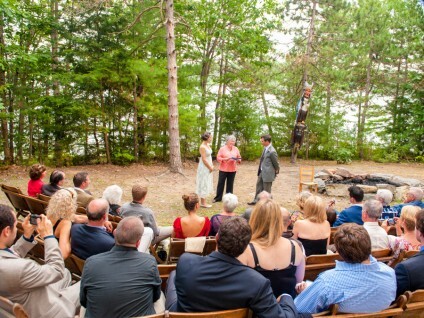 Set on a pristine 200 acre peninsula that opens onto a beautiful Maine lake, Camp Caribou has hosted many memorable weekend weddings! There are a number of ceremony locations around our peninsula that are tucked away among the cathedral pines and others with breathtaking views of our lake. Our dining hall offers the perfect summer camp reception hall. This historic building built in 1922 seats 300+ people and overlooks the entire camp grounds. With its wood cabin feel and recently added full length deck, our lodge provides the ideal camp wedding setting. For accommodations, we have 16 cabins with full sized bathrooms and 4 private cabins with full sized bathrooms. For more information, please contact Alex.